The UK has received quite a bit of snow recently. We didn't get much snow here in Market Harborough, but I did go out in the afternoon on a couple of days to take some photos before the snow melted. These first few were taken on 27th November, after the first lot of snow. 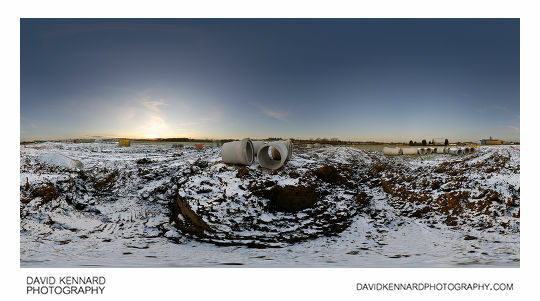 I went out to Farndon Fields, which is currently having a sewer system installed for the future housing development there. 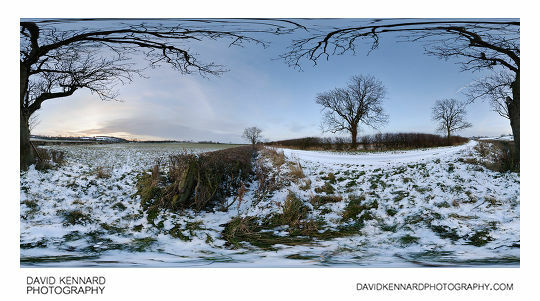 You can see in this next pano we didn't get much snow, some parts of the UK got over a foot. 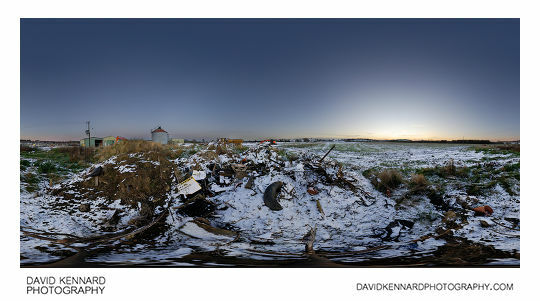 I took another pano on part of a pile of mud and rubbish, it was quite tricky to keep out of the shots as I moved the camera round to take the different photos for the panorama. 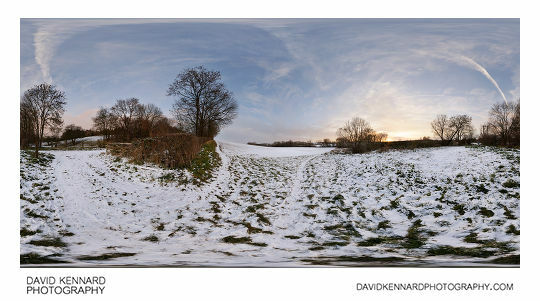 The little snow we had started melting, but then we received some more snow, so I went out again on 1st December and took a couple more panoramas in the local countryside. This next one I think I would have preferred on the other side of the hedge so that the tree wasn't blocking the fading sunlight, but I didn't have enough time. I then walked up the road, which was very slippy where the cars had packed down the snow. My foot did slip a few times, but thankfully I didn't slip enough to fall over. 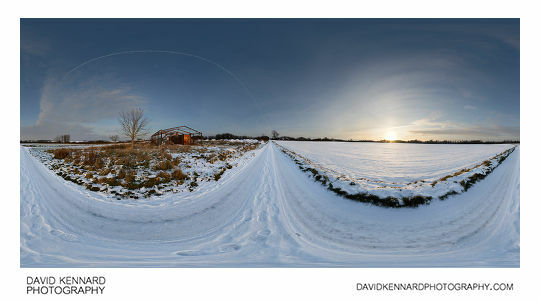 Further on down the road I took another panorama at the entrance to a field. This one took a long time to process as each time I thought it was finished I'd then see another stitching / blending error in the tree branches. 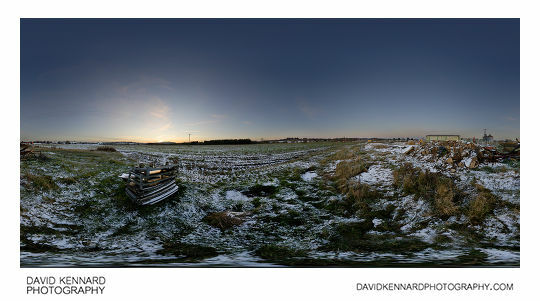 By 5th December all the snow in the areas that receive sunlight (like the fields) had melted. Personally the cold and snow doesn't bother me much, and I would actually quite like it if we get some more snow. 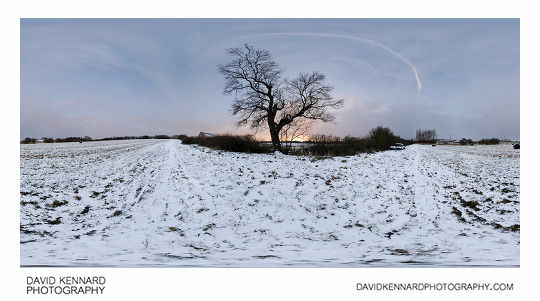 If we do get some more snow, then I'll go out and take some more panoramas.